There was a summer school in a Philippine Marines camp sitting on the smooth coast of Sulu Island. Every day more children came; first, there were about 20; then that grew to nearly 80. All of them huddled there to learn the alphabet and the numerals. It was an unbelievable sight, for those children and their families had known little else except poverty and war. The other public schools in the villages of Patikul, a place where so-called separatist rebels ran free, are mostly empty and rundown and targets of attacks. The teachers are weary, or afraid, or unpaid, leaving the idea of an education obsolete. But that summer last year, something in Bun-Bun, one of Patikul’s backwater villages, changed. The boys began to play soccer with the Marines. The camp became a magnet for their unspoken hopes, the only government presence that gave them the possibility of what a normal life could be. When the regular classes opened in the monsoon season in June, they were ready to go to school again--some 200 children riding in military trucks and vans that served as their school buses, instead of walking for kilometers on end. In the spark of that summer dream, they could not be let down. There had to be some kind of continuity, and the villagers tried to hold on to that in the symbol of the woodpile dock leading out to the blueness of the sea, where visitors arriving on their shore could help them. There was a lot of fun, too, during those weeks when the sun and the moon displayed their best, giving us the answers for what has to be done with the children. The girls welcomed me with a pangalay dance after I came down from a steep hike in the forest across a smaller island. Along with the Marines, I saw more of this haven of Sulu that ought to be seen by others. There was nothing to lose. Right there and then, the officers in the camp hatched a campaign for tourism under their banner as “peace warriors,” unheard of in these parts, which were perhaps too dangerous for the idea. It came to them as a measure to prevent more fighting; they had no idea it would get far bigger attention and be shown on television. That’s how it started. In the months following, in February this year, the first Dive-for-a-Cause became a splash. It all came about serendipitously, with friends helping friends by word of mouth. The Black Pencil Project landed on the shore with notebooks and pencils and crayons for the children, bringing on TEN (The Entire Nation) Moves, a staunch endeavor of social activists aiming to provide schools in impoverished provinces, from the north to the south of the archipelago. Sulu, this particular south that has seen about 40 years of insurgency, suddenly fell into the favor as a potential “tourist destination,” one done in a controlled manner for security reasons, under an arrangement with the Marines. The outsiders were coming for a good reason, and the last thing they would want was another newspaper headline about a rebel kidnapping. The first batch of 15 scuba divers pitched in nearly a million pesos worth of school materials, in exchange for their three-day get-away, like any typical dive excursion (as if they were going to the prime diving sites of Verde Passage in Batangas, or the Apo Reef in Mindoro). The tourism plan was meant to obtain about 25,000 pesos (roughly $600) per person, to augment the cost of transportation, lodging, food and some entertainment. Others offered more; as much as 50,000 pesos and adding construction materials such as wall paint and iron-sheet roofing and, most of all, a solar panel to power interactive learning later on. And for the first time, they had toilets and a wash area to go with their classrooms. The children may not quite know how to use one, but they will learn. They’ll get with better help from the local teachers who are to be trained by the Ateneo de Zamboanga University, which has a center for peace among Muslims and Christians. What the children were seeing before them might have been incomprehensible; they lived in stilted huts of straw and sawali (woven bamboo strips). The outside world they had seen was from television screens they pay to watch for a few pesos. Because of the armed conflict and the tragic neglect that followed it, Patikul–like most of Sulu–has had no basic services like running water and regular power. The villagers have had to rely on the military camp for that. The school became a celebrated centerpiece, with a mural artist from Manila coming all the way down south to make the event stand out, for others to follow. 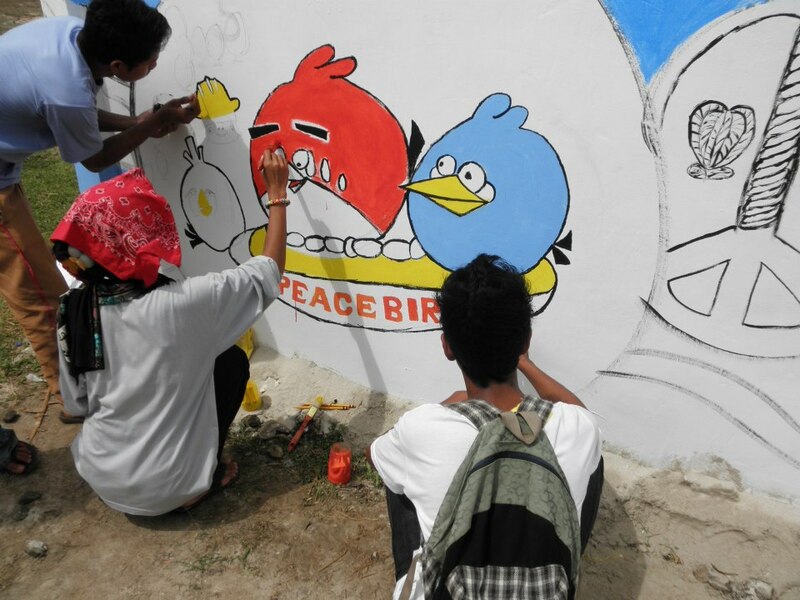 A “Peace Wall” sprang up in the main town where, in recent years, gunshots criss-crossed enemy lines. The kids and most everyone were having so much fun that the Marine battalion had to shell out a big cut of their already meager budget to buy cans of color paint and brushes. Things were getting better. In May, a new set of divers came in for this social cause, donating an estimated 200,000 pesos in advance for another school to be built in Patikul. When I was there in Bun-Bun last summer, when everything seemed bright and focused, I felt then that an ambition of this scope could come to fruition. The dock from the camp was its lifeline; it was from here that we had set out in search of coves, barren islands and of hidden lakes. This made us all think something could be done. It was for the sake of summer fun, but the cove was swept free of jungle debris, which was replaced by picnic huts. 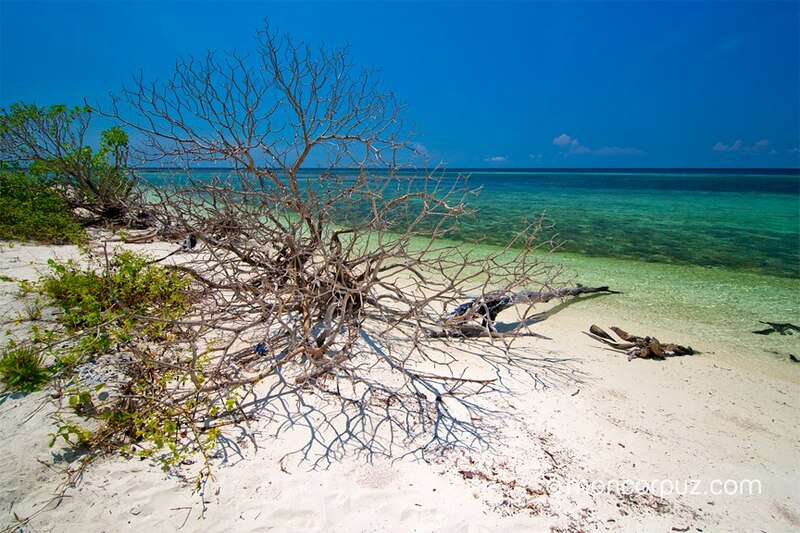 The smaller islands across became dive spots when a Marine sea-borne company surveyed the area and gave it an okay. I could imagine the bliss going through the divers when they set out with their oxygen tanks, vests, masks and flippers to the depths that I have grown to love, on this island that I have written so much about. They had their breakfast on a deck built in the shape of a star and a crescent moon. It was attached to that flimsy dock where, in our dream of dreams, we said a new world would begin. I’m sure anywhere else would not compare with the dawn they had seen. And in the evenings, they watched the children dance and other villagers perform the Sulu traditions of gongs and plays. They listened to the love songs of the Marine band, after a boodle fight consisting of the best seafood on plates of banana leaves. When they departed, they carried off with them gifts of abundant exotic fruits that make up the scent of this island. The divers had set out from Zamboanga City–the bottom tip of the peninsula on mainland Mindanao, from where they took a Multi-Purpose Attack Craft (known as M-PAC) at the wharf of the naval headquarters of western Mindanao. The trip took less than three hours at 45 knots. They came as a group and were organized by the Marines. If you are planning to come on your own, you must take a lot of caution. There are regular connecting flights of Air Philippines flying into Jolo, the capital of Sulu Island, but finding lodgings is not going to be as easy. It’s best to seek advice or help from the offices of the mayor or governor; better yet from a local resident who could be your guide. You can also inquire from the regional tourism office in Zamboanga City, next door to the famous Lantaka Hotel By the Sea. In Jolo you can visit the museum and the provincial capitol (whose slightly Moorish architecture has outlived the wars) that stand at a cul-de-sac, at the end of a road flanked by fire tires. In town you may notice some signs of the colonial days of the Spanish and Americans: the looped gate, the wall that covered the small city, the municipal hall, the wharf. I would not miss a visit to the Bud Datu, a hilltop camp near the city limits, which the Marines have turned into a nature park for picnics and bird watching. 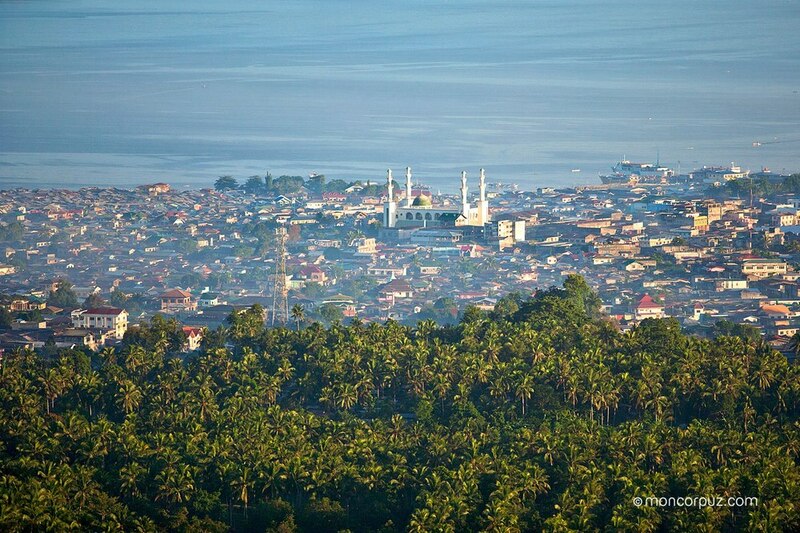 From the balcony of the headquarters they call the “white house”–there’s a mock Starbucks sign and the local Sulu coffee is served–you can see a mesmerizing view of Jolo, the wharf, the sea and the grand mosque built a few years ago to the tune of millions of pesos to replace the historic green Tulay Mosque, from where was signaled the start of an uprising in the early 1970s, a tragic event that led to the burning of Jolo. The particular Marine battalion camp in Bun-Bun is about 20 kilometers from Jolo, to the east of the Patikul area, and there is no other way to get there but to join the Marine convoy by land; so it is best to get in touch with them first. It can also be reached by water from the Jolo wharf or, as in the case of the divers, by MPAC direct to the Bun-Bun dock. Do otherwise at your own peril. Public jeepneys are hard to come by and you, being a stranger, would soon stand out: not a good idea. If you wish to be part of Dive-For-A-Cause, or if you’d like to pool friends together for a visit, do it through the Marines based there. Check out their Facebook page–Bunbun Beach, Patikul, Sulu (A Day Tour with the Peace Warriors of Sulu)–as well as those of any of the following: Greg Hernandez (previous commander of the Marine battalion in Bun-Bun), Angelo Valencia, whose pseudonym is Kuya Pultak of TEN Moves, Mon Corpuz of the Black Pencil Project, or Mercia Allih of Matawkasi Inc. They know what to do when you’re in their hands, and you will see a place where very few have gone and what was once the center of the maritime world in Southeast Asia. Make it worthwhile. Criselda Yabes is a fellow on a one-year writing grant at the University of Nevada, Las Vegas. She was based in Manila and wrote books on the military and Mindanao.